Former President George W. Bush on Thursday issued a thinly veiled warning about the state of American democracy under the current president, arguing that "bigotry seems emboldened" and politics is "more vulnerable" to conspiracy theories. 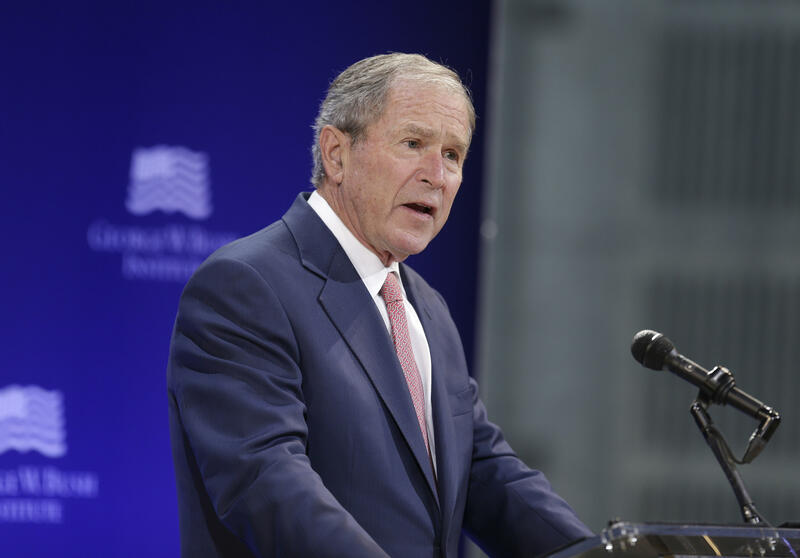 Speaking at the George W. Bush Institute's "The Spirit of Liberty: At Home, in the World," a national forum in New York City, the former president warned that the trend in Western countries of moving away from democratic confidence and global engagement is seeping into American culture. Parts of Europe, Bush said, have developed an "identity crisis" as a result of economic stagnation, youth unemployment and fears about immigration. "America is not immune from these trends," warned Bush, who noted that public confidence in U.S. institutions has declined in recent decades and discontent has "deepened and sharpened" partisan conflicts. "Bigotry seems emboldened. Our politics seems more vulnerable to conspiracy theories," he said. "We've seen nationalism distorted into nativism." Bush warned that the U.S. faces the return of isolationist ideology even though he said that American security is "directly threatened by the chaos and despair" of other nations around the world. The former president listed a series of recommendations that he suggested would improve the state of democracy. First, he said that the U.S. must harden its defenses in terms of confronting cyber threats. "The Russian government has made a project of turning Americans against each other," said Bush, who added that cyber threats should not be "downplayed or tolerated." Bush said that there should be a projection of American leadership, the importance of active citizenship should be strengthened and trust in democratic institutions should be restored. He said that Americans should pass civic ideals onto the next generation. "Bullying and prejudice in our public life sets a national tone," said Bush, who added that it "provides permission for cruelty and bigotry." American democracy, he said, needs a media "that is transparent, accurate and fair." Bush said that the American spirit doesn't say that "we shall manage" or should just deal with it. "It says, 'We shall overcome,' and that is exactly what we're going to do with God's help," he said. Bush never explicitly named President Trump by name in his remarks. The event also featured remarks by former Secretaries of State Madeleine Albright, Condoleezza Rice and U.S. Ambassador to the United Nations Nikki Haley.